Custom SkyDancers® from SkyDancers.com is the best way to create a tailor-made advertising product to send the exact message the attract the right patrons to your business or event. Available in 6ft, 10ft, and 20ft sizes; our custom SkyDancers can be made to your exact specifications and needs. Can't find that right SkyDancer® from our already large lineup of designs and colors? Very unlikely, but not impossible and easily solved by ordering our Custom SkyDancers. Constructed using the same high-end materials and workmanship as all of our Sky Dancers, our Custom SkyDancers are hand-made with your custom embroidered lettering and your optional custom logo. Because of the care and time we put into crafting each one of our Custom SkyDancers, turnaround time is two weeks to get to your front door and we never begin work until you receive a sample proof that you are extremely satisfied and happy with. Set yourself apart from the rest and order Custom Skydancers from SkyDancers.com. 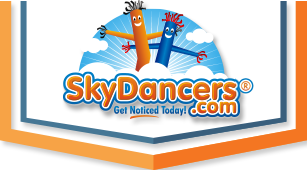 Custom Sky Dancers® from SkyDancers.com is what many of our customers choose to send that specific message or get that special logo in the heads of people that pass by or happen to catch a glimpse of the Sky Dancer® on the street or while driving. You'll get more patrons who will search out your business or establishment by name and logo. Take away the guesswork in the minds of passing traffic and target the people that you know will definitely patron your business or event. Custom Sky Dancers from SkyDancers.com is the sure-fire way to not only attract traffic into your business or event, but attract the right traffic.